22a. [Narrow passages for killer whales? ], ORCHESTRATES. Orca straits. 27a. [Fable about smoked salmon? ], LOCKSMITH. Lox myth. 33a. [Raised some vegetables? ], GROUPIES. Grew peas. Different emphasis on syllables here, though. 35a. [Decrease in the number of people named Gerald? ], GERIATRICIAN. Gerry attrition. 54a. [Belts for a Chinese leader? ], MOUSETRAPS. Mao straps. 75a. [Inventors’ diaries? ], IDEALOGUES. Eww. This would be much better with the primary spelling, ideologues. Especially since the pun is based on “idea logs,” and there’s no spelling change at all for the “idea” portion. 92a. [Cloudophobia? ], STRATOSPHERE. Stratus fear. 95a. [Opposite of a strong boil? ], DULCIMER. Dull simmer. 100a. [What brings the rocket to the pad? ], MISTLETOE. Missile tow. 110a. [Jewelry for the oracle at Delphi? ], PROFITEERING. Prophet earring. Different “T” pronunciations here. 3d. [Fuss about “The West Wing” actor Rob? ], LOCOMOTION. Lowe commotion. 41d. [Small undergarments? ], WHEATIES. Wee tees. 49d. [Carried cash around? ], BORDEAUX. Bore dough. 72d. [Help with the harvest? ], PHARMACIST. Farm assist. I like the theme for the most part, but there may be too much theme material for the grid to bear. IT’S OPEN/ON IT/IT’LL DO/REDO/TO DO duplications, plus fill like CLU SAILHO INRI ROARER/MOANERS ALLROUND (haven’t seen this one before) RELETS FTLEE LETT TESSIE … felt like there were more clunkers throughout the grid than I want to see. 109a. [Mark Twain farce about a painter who fakes his own demise], IS HE DEAD? Never heard of it, but you can’t complain about Twain titles. 51a. [First mass consumer product offering Wi-Fi], iBOOK. And now? Aren’t there kitchen appliances offering Wi-Fi? 58a. [Oakland’s Oracle, for example], ARENA. I like the echo of the Oracle of Delphi in the 110a clue. 13d. [It might pick up a passing comment], HOT MIC. Great entry, fresh. 33d. [Service with more than a billion users], GMAIL. I wonder if that’s really accurate. Wikipedia says there are 1.2 billion users, but it’s possible that my husband and I are counted as five or six people. 50d. [Schoolmarmish], PRIM. There are, of course, plenty of prim men out there. Mike Pence is pretty prim, isn’t he? 60d. [Un-to], FRO. What an odd clue, using un- for “not.” I think I like it. I’m taking the handoff from Amy this weekend. Ed and Rich give us phrases in which a word has been replaced by a unit of measurement with amusing results. 23a [Measly treat for Polly?] is a GRAM CRACKER (graham cracker). Wasted on parrots; should be reserved for s’mores. 32a [Work required to raise kids?] is FAMILY JOULES (family jewels). I don’t think this is referring to the pearl necklace from Grandma. 41a [Advantage in kickboxing?] is FEET OF STRENGTH (feat of strength). I didn’t realize this was a Festivus-themed puzzle. 62a [The buying power of cash?] is WATTS IN YOUR WALLET (what’s in your wallet). This one made me laugh out loud. 86a [Cub soda?] is LITER OF THE PACK (leader of the pack). 94a [Polished pearls?] is GLAZED CARATS (glazed carrots). This one is about the pearl necklace from Grandma. 110a [Bad snippets of Miss Muffet’s memory?] is SPIDER BYTES (spider bites). Spider bites are pretty rare; most things that people call “spider bites” are actually other insect bites. This has been your medical PSA for today. The theme holds together well and the entries are funny. It’s a nice solid Sunday theme. Hindu x 2 at 1a and 11d: [Hindu “sir”] for BABU and [Hindu title] for SWAMI. Swami, how I love you, how I love you, my dear old Swami….oh, wait. 45d [4-point F, for one] is TILE. This is not what I usually think of as Scrabbly fill. 64d [Mustang sally?] is NEIGH. Cute. 93d [Opposite of pass] is REPEAL, except it’s not really. The opposite of “pass” in regards to bills would be “defeat.” A law has to be enacted before it can be repealed, and that means the bill has to be passed first. So of course I leave you with this. 25a. [Notable nacho dip, informally?] GUAC OF FAME (G + WALK OF FAME). This one depends on how a person pronounces “walk.” My “walk” has the same vowel sound as “law” so the new phrase sounds slightly different. Someone who pronounces it the same as “wok” should not notice a problem. 99a. [Large room full of little lizards?] GECKO CHAMBER (G + ECHO CHAMBER). This would be a great band name. Too bad it’s taken already. Lots of singing talent towards the top of the grid: NINA Simone, FIONA Apple, RITA ORA, and ANITA Baker, who announced her retirement from music after a farewell tour starting in March. 24d. [Nabisco delectables] OREOS. It’s great to see a new clue for the cookies, but “delectable” is pushing it. 105a. [CheapOair listings] FARES. CheapOair has been around since 2005, and I can’t remember hearing their name until now. Anyone have experience booking through them? 2d. [Magnate Musk] ELON. Worth mentioning for this perfect symmetry: SpaceX launched their Falcon Heavy rocket on 2/6/18. 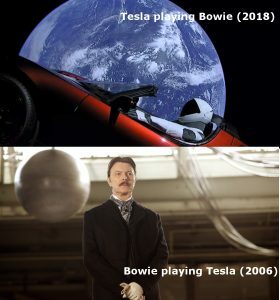 It carried ELON’s Tesla Roadster, and Bowie’s “Life on Mars?” played during the launch video, leading to meta memes like this one. This entry was posted in Daily Puzzles and tagged Ed Sessa, Evan Birnholz, Matt Ginsberg. Bookmark the permalink. Ack! Amy, you are absolutely right about IDEOLOGUE. Believe it or not, I mistyped it when beginning the fill. It surely would have been no harder to fill from there than from what I did. I liked this puzzle a lot. The puns were all fun to suss out. I like puzzles where, once you grok the theme, you still have some work to do piecing it together. It took more time than it should have for me to realize that 72d parses as “Farm assist,” and not “Farm a cyst.” Definitely the answer in the puzzle was better. 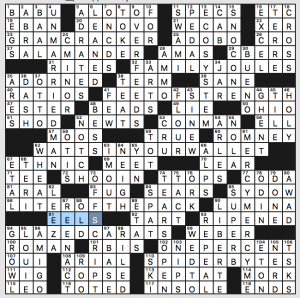 My one little complaint is that cluing GERIATRICIAN with the word Gerald in the clue. Gerry is just short for Gerald, no? Anyway, it’s a small point. Fun solve. Yeah, but GERIATRICIAN is etymologically unrelated to Gerald/Gerry. We don’t really use “Jerry” to mean a German anymore, so this is a tough one to clue without a name. Might’ve been a good candidate to leave on the cutting room floor. Ah, was waiting for Amy’s explanation of STOY, and the IDEALOGUE answer does help (and isn’t satisfying, as you say). I like that the theme meant lots of hard to get puns, but no question the fill otherwise wasn’t for me, like NOSEEUM, some proper names, and second and fifth as UNITS. I was also waiting for Amy’s explanation (thanks) of LOCOMOTION. I guess overall I liked this one, but still qualms. Full confession: I apparently didn’t quite know how STRATOSPHERE is spelled before doing this puzzle. The O just looks wrong to me. And I didn’t even pick up on the issue with IDEALOGUES. Used to be good at spelling too. Why wasn’t 14 Down included in the theme? 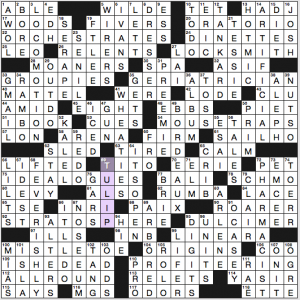 The clue could have read: REFEREE AT MOMA? Over at the Wordplay blog, Matt Ginsberg admits that IDEaLOGUE was a typo that he overlooked in the process of construction. Mistakes like this happen when constructing. But isn’t the ultimate problem with the editing? Shouldn’t this have been caught before publication? Will et al. must have thought Matt meant this variation and they felt it passed muster. Dude, did you not see the very first comment in this thread, from last night? Where Matt acknowledged that it was a typo? I mean, really. And yes, Alan D., this is exactly what the editors should have flagged. There’s no reason not to refill that section to avoid an oddball variant spelling. The IDEO- spelling also works with the theme more elegantly, not spelling a chunk exactly the same as the word the clue points to (idea). D’oh! No, I searched for “IDEALOGUE” to see if it had been brought up in the comments yet, but Matt’s comment didn’t happen to use that word. Obviously, I should have read through the comments. Sorry. Thanks, Erin. It may be absent-minded of me but I hadn’t realized how many singers in the top half there were (plus RAE at 9D and I guess ALTO at 19A). Shout-out to Patrick Blindauer who came up with the title for this puzzle. I think it’s spot-on. I didn’t mean it was a problem. Just that there was some good talent included. Forgot about Carly RAE Jepsen, too. Oh, I know you didn’t mean it that way. It just never registered with me how many singers were up there until you pointed it out (I do recall thinking FIONA next to RITA ORA was a tad unusual, though). 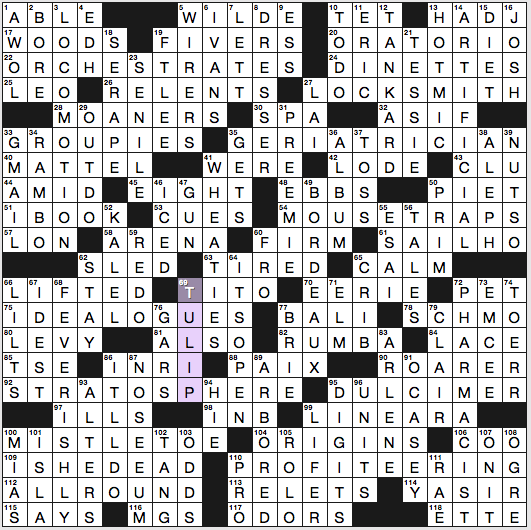 LAT 83 across, what the hell is fug? LAT: CBERS, XER, ELL, EBAN, DENOVO, BABU, CRO, AMAS, ARAL, FUG. FUG that. “Single-minded about” can be WEDDED TO, but not WED TO. “Ad-libbed” can be WENT OFFSCRIPT but not just plain OFFSCRIPT. What dreck. FUG? Searched & found it’s been around since the late 19c. I can’t wait when my Scrabble buddies challenge me on this entry & I get 50 bonus points. 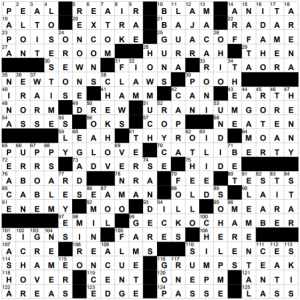 I am happy for Matt Ginsberg because his puzzle was very nicely treated by the graders and the commenters. It was one of the most torturous NYT Sundays ever. This is, imho, how a puzzle like this would greatly improve. * Cut down on the theme answers, or make them distinctive, or make them have a common link, or something. This is, what, 14 answers that have no connections whatsoever except for being groan-inducing puns. * If that’s too much to ask, then pleeeeease make the fill better. This was so much bad stuff for even a Sunday puzzle. * And if those are still impossible to do, please toss some help the solver’s way via the cluing. Thanks. 1 star from me, which is very rare because I weigh the fill, theme, clues and pleasurability separately. This one has failed me almost on all fronts.